An auction of celebrity doodles and paper memorabilia will be held in Michaelhouse, Trinity Street, Cambridge at 6.30 pm on March 28th 2012. The auction is in aid of the Jean Grove Trust, a local charity which pays for the education of extremely poor children in Ethiopia, supporting schools in Bahir Dar on the shores of Lake Tana, in Zizencho in the inaccessible south and in the harsh border region of Tigray, in the far north. 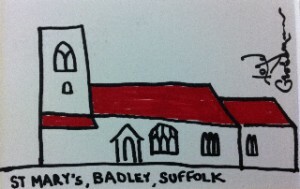 The doodles and manuscripts to be auctioned include items by statesmen and politicians as diverse as Lech Walesa, Herman von Rompuy and Jeffrey Archer,by literary figures from Sebastian Faulks and Clive James to Margaret Drabble and Seamus Heaney, by journalists and broadcasters from Alan Rusbridger and Jon Snow to Bamber Gascoigne and Lloyd Grossman. 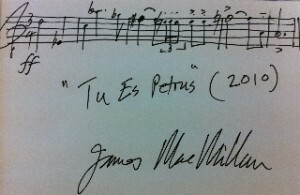 The composer James MacMillan has offered some original bars of music. The novelist PD James has given fascinating insight into her working methods with the donation of some pages of typescript from her latest thriller, “Death comes to Pemberley”, with her hand-written emendations. Cartoonists Gerald Scarfe and the Daily Mail’s Mahood have donated superb drawings, and the Archbishop of Canterbury has produced a rather surprising episcopal seal. 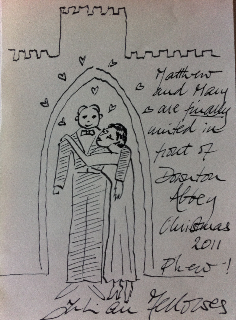 Perhaps of most topical interest will be the drawing by Julian Fellowes of Mary and Matthew finally united at Downton Abbey which is expected to be highly sought-after. All the auction items will be on display in Michaelhouse in the week leading up to the auction, and will shortly be displayed online at jeangrovetrust.org.uk. The Trust is a small Cambridge–based charity, founded in 1999 at the instigation of the late Dr Jean Grove, geographer and Fellow of Girton College Cambridge. The Trust supports directly four schools in different parts of Ethiopia, paying for the clothes, food, books and fees of the poorest children. The Trust has no overheads or administration costs: every penny that is donated goes to the schools, and direct contact between the schools and the Trust ensures that the money is directed to where it is needed most.